This week my son started kindergarten and my husband began his first (of many) work weeks of forced overtime. I've needed sewing as therapy desperately! Somehow, this side (picture below) ended up with a lot more yellows and it's not as balanced. Good to remember to watch that for next time. Before I sewed up the lining, I took this picture to show this fun combination of prints inside the bag. That bird/floral print was one of the first "modern" fabric prints I bought several years ago. The house print isn't from the same fabric line but they go together so perfectly. I love it when that happens. Aren't bag linings a good way to use fun multi-colored fabrics that might be hard to use otherwise? I love making bags so much and have decided to stash such projects for future birthday or Christmas gifts since I already have so many for myself. It feels good to be ahead of schedule with gift giving! Linking up with Finish it up Friday and Super Online Sewing Community Match at Sew Mama Sew. But when I put the two together, I didn't like how they looked at all. The problem is that the deer fabric is printed on a very brown linen, and I chose bright white prints for the patchwork piece. Normally I try not to fret too much about white and off-white going together, but this bugs me too much! This whole Weekender debacle has made me feel like I am making a lot of creative mistakes and not catching a lot of simple problems that could be avoided with more care. I have also been thinking that I am definitely motivated to sew, but I am having a hard time coming up with projects and fabric combinations that I am really excited about. I think my mental block is definitely related to sleep deprivation/interruption and having so little time to sew lately. I came across a blog post, from Gnome Angel, recently with this quote, "Life is too short to make things that make you unhappy. I would rather not deliver on something then take the time away from my family to make something that’s sub par. 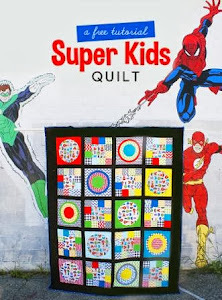 Life’s too short for bad quilts!" I completely agree with Angie. I don't need to put so much pressure on myself. I don't have to create a masterpiece with everything I make. So I am going to give myself a break and just work on some simple projects. Projects with patterns. If I follow a designer's fabric print/color suggestions, it's okay, I don't always have to reinvent the wheel every time. I almost always try to throw in my own twist on projects, but if I want to make an exact duplicate of something from a book or tutorial, so be it. Over the weekend, I had a bunch of sewing friends over to work on projects together. I only had the baby to look after, so it felt like a vacation! I spent my time visiting and cutting up squares for the Color Dive quilt. 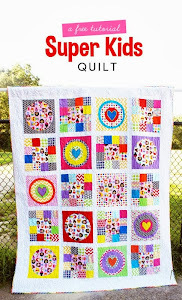 This is exactly the kind of "easy" "no brainer" project I need: charm squares and half square triangles made out of Anna Maria Horner fabrics. It's simple and I know I will still be happy with it because I love her fabrics and the pattern. I also finally cracked open my City Weekend bundle I've hoarded for years. I usually don't love pastel fabrics but this collection has been one of my long time favorites. I am pairing it with blenders from my stash to make 9" churn dash blocks. It's another simple project that will hopefully result in a pleasing vintage style quilt. This is the last project I completed recently in completing the decorating of my sewing room. The mat and frame came from a yard sale and I spray painted the mat bright pink. The mat was originally a dark, dusty blue. Sorry about the poor picture- it was difficult to photograph. 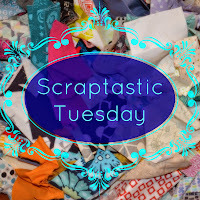 To fill in the letters, I simply glued scraps of my favorite sewing themed collection, Sew Yummy, to the back of the mat.